We're Endorsing: The Summer Nap | Valet. As adults, we no longer get three months off for a summer break, but there's something about this time of year that just begs you to take things easy. And what's easier than a midday nap? You know the drill: you've been reading in the backyard or laying by the pool—maybe you've just come in from the heat and plopped down in your favorite chair. Your body is relaxed. Your eyelids are heavy and you slip into a blissful state of sleep because, well, it's summer and you can. After all, napping is a universal rite of life when the weather's warm. The siesta is common in a number of Mediterranean, tropical and subtropical countries as a way to take a break from the scorching midday heat. 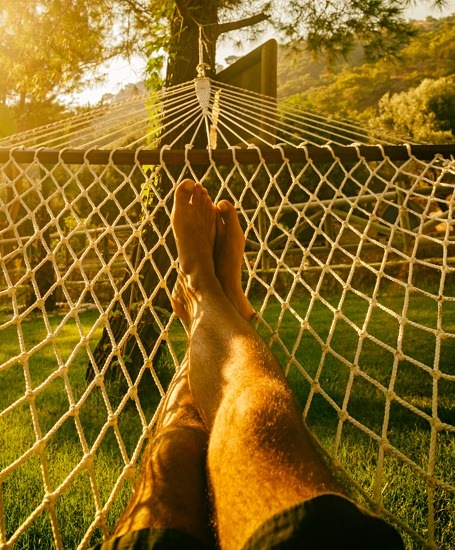 What's more, the siesta habit has been associated with a 37 percent reduction in coronary mortality in those countries, possibly due to reduced cardiovascular stress mediated by daytime sleep. According to Dr. Sara Mednick, a leading sleep scientist and author of Take a Nap! Change Your Life, napping not only benefits your heart, but also boosts brain activity, speeds cell repair and lowers stress. So don't fight the feeling when that familiar drowsiness hits you after lunch. Succumb to the indulgence of letting yourself fall asleep in the middle of the day. Do it outside with a hat over your face and get a little vitamin D. Or curl up in the cool calmness of a well-air-conditioned space. Whatever you do, don't sweat the lack of productivity. Because in the end, your body's better of for getting the extra sleep. And the unplanned, easygoing nature of a nap is the ultimate summer luxury. The kind that doesn't cost you a thing. Mednick offers some tips to help maximize your rest. After lunch is the prime nap time. Circadian rhythms make later afternoon a more likely time to fall into deeper sleep, which leaves you feeling groggy. In the hour or two before your nap time, eat foods that are high in calcium and protein, which can promote sleep. Rent relaxing spaces by the half hour with Breather or use Stereopublic to find the quietest spots in your city. Then let an app like Sleep Cycle time your nap and wake you up before you fall into deep sleep. Some shut-eye hacks to boost your productivity, relationships and overall health.